Also known as chow-chow or piccalilli, this green tomato relish is a Southern favorite, and it's great with sausages, pork, and ham, or serve it with hot dogs or burgers. 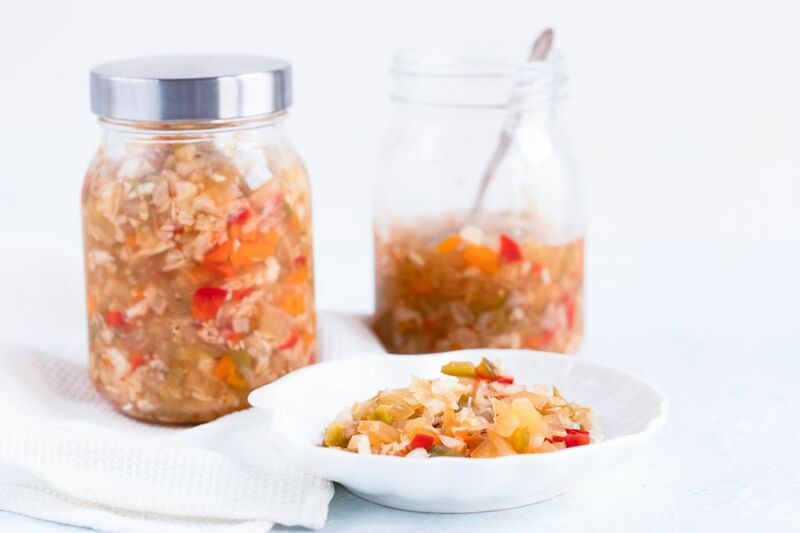 The relish is a combination of chopped green tomatoes, cabbage, onions, and peppers. The vegetables are brought together with a mixture of vinegar, brown sugar, and seasonings. Combine the chopped vegetables in a large nonreactive kettle or bowl. Add the salt and stir to combine thoroughly. Cover and let stand for 4 hours or refrigerate overnight. Prepare the canner and jars. Add water to a large canning kettle with rack and heat to a boil; reduce heat and keep at a simmer. The water should be high enough to be at least 1 inch above the filled jars. I usually fill it about halfway, and I keep a kettle or saucepan of water boiling on another burner to add to the canning kettle as needed. Wash jars thoroughly and heat water in a small saucepan; put the lids in the saucepan and bring almost to the boil; lower heat to very low to keep the lids hot. In a large nonreactive kettle, bring the vinegar, brown sugar, and seeds and spices to a boil. Reduce heat to medium-low and continue simmering for 5 minutes. Add the drained vegetables and bring back to a boil. Reduce heat to medium-low and simmer for 10 minutes. With a slotted spoon, pack the vegetables into prepared jars. Cover vegetables with the pickling liquid, leaving approximately 1/4-inch headspace. With a clean dampened cloth, wipe the rims of the jars. Place the flat lids on the jars then close caps with screw-on rings tightly, but do not over-tighten. Arrange the filled jars in the canning kettle and add more water, as needed, to be at least 1 inch above the jars. Bring to a full boil. Cover and continue boiling for 10 minutes. Remove the relish to a rack to cool completely. This is an excellent way to use end-of-the-season green tomatoes.